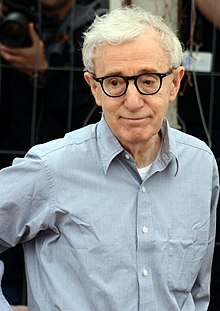 Heywood "Woody" Allen (born Allan Stewart Konigsberg, December 1, 1935) is an American actor, comedian, filmmaker an playwricht, whose career spans mair nor 50 years. ↑ 1.0 1.1 Lax, Eric (1991). "Woody Allen: A Biography". Woody Allen: A Biography. Retrieved February 3, 2014. Woody Allen was born in Brooklyn, New York, in the spring of 1952, When Allan Stewart Konigsberg, who was born in the Bronx on December 1, 1935, settled on the name as a suitable cover. This page wis last eeditit on 19 Mey 2018, at 04:36.